Snap shares gained almost 3% Friday morning after CEO Evan Spiegel said in an internal memo that the company plans to get profitable next year. Spiegel admitted that Snap “rushed” with its redesign and now plans to grow at a sustainable pace. The company plans to grow in new markets like India, Indonesia, Mexico, and Brazil. 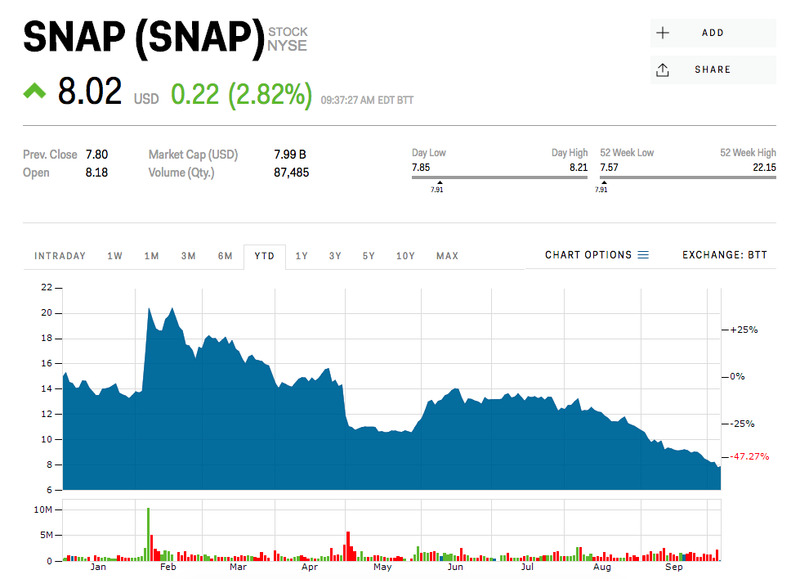 On Thursday, Snap fell below $US8 for the first time since going public in early 2017. Follow Snap trade here in real time. Snap shares gained almost 3% Friday morning after CEO Evan Spiegel said in an internal memo that the company plans to reach profitability next year. In the memo, which sent out on Thursday and contained more than 6,500 words, Spiegel admitted the Snapchat app was too fast in releasing its controversial redesign, which led to the company’s first drop in daily active users. Spiegel also acknowledged that Snap plans to grow at a sustainable pace. In order to increase its revenue, he said Snap will have to grow in new markets like India, Indonesia, Mexico, and Brazil. The company will also have to increase advertisers on its platform and improve ad measurement for advertisers, he said. The memo comes after the Snap shares sank below $US8 on Thursday for the first time since going public in early 2017. Evercore ISI analyst Anthony DiClemente said that competition from Instagram is “irreversibly reducing” the company’s ability to meet investors’ long-term expectations. Snap shares were down 46% this year through Thursday.